GandhiCam for post-8700-series Blackberry devices is an application that will automatically wirelessly upload your pictures or video as they are taken to prevent confiscation by the police. This application is a response to a spate of incidents in which UK police have deleted or confiscated pictures taken by tourists or by protesters at events like the G20 summit. This app is for BlackBerry only and is compiled using the 4.2.1 SDK, it’s only been tested on a 9000/Bold but should work on all post-8700 series devices (Pearl/8100, 8800, Curve/8300, Bold/9000). This is completely unsupported by Hippocamp Software, if it doesn’t work for you we’re sorry but can’t spare the time to help. If you’re using a Storm - good luck. The name "GandhiCam" derives from the satyagraha philosophy of civil resistance developed by Mohandas Gandhi and applied so successfully during the Indian struggle for independence from Britain. 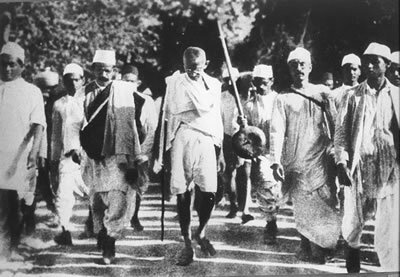 One of the key elements in the application of satyagraha to solving social problems is making sure that the protest is public and preferably photographed to be seen by as many people as possible. The video content was then uploaded to a secure location. I don't claim to have invented the concept - as you note, sousveillance has a long and distinguished (if slightly obscure) history, and the idea of wirelessly uploading the evidence to protect it from sequestration is an obvious development from there. Ultimately my only interest is in getting this functionality on as many phones and mobile devices as possible - I think it has the potential to massively increase the transparency of society, as well as increasing personal safety and a whole raft of other benefits. Thanks, Shaper_pmp. It's a great idea and kudos to Reddit user rehsif for implementing it so a large number of people can try it out. End update. Read more about (or download) GandhiCam; via BoingBoing Gadgets.